By Allan Fox: WBO welterweight champion Tim Bradley (30-0, 12 KO’s) has an important fight next week against Juan Manuel Marquez (55-6-1, 40 KO’s), but that’s not keeping Bradley from looking past the 40-year-old Marquez towards a badly wanted fight against Floyd Mayweather Jr. This is a fight that Bradley says he really wants, and he thinks he’s got the talent to not only give Mayweather problems but also beat him. It’s probably safe to say that with Bradley being a Top Rank fight his chances getting to Mayweather are less than zero. Mayweather hasn’t been fighting any Top Rank fighters for a while now, and that’s not likely to change even with Bradley saying he’d like to fight him. Bradley will likely have to be satisfied with fighting Top Rank fighters for as long as he stays with that promotional company, which isn’t really bad. 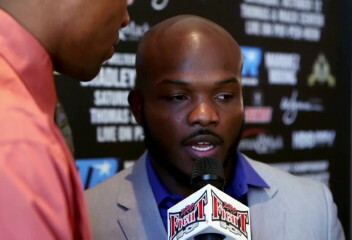 Bradley has the options of fighting Manny Pacquiao, Brandon Rios, Mike Alvarado two or three times. Of course, if Bradley suddenly starts losing repeatedly then he may not get to fight all of these guys a bunch of times. He’s going to have to keep producing if he wants the big fights against those guys. There’s major questions whether Mayweather would even choose to fight Bradley if he wasn’t with Top Rank, because he’s not a popular fighter, he barely beat his last opponent Ruslan Provodnikov, and the biggest win of his career against Manny Pacquiao was a highly questionable one. Let’s face it; Bradley’s biggest win of his career isn’t even considered legit among many boxing fans. Bradley vs. Mayweather would be interesting to see how Mayweather deals with Bradley’s pressure style of fighting. Bradley isn’t all that fast anymore now that he’s at 147, and he’s still as weak as he was when he fought at 140. The only thing seems to be still a part of his game is his tendency to come in head first when he fights making it difficult for his opponents to avoid the crown of his head. With that kind of fighting style, Bradley could give Mayweather problems in terms of cutting him up with accidental head-butts, but he isn’t going to be quick enough with his hands to beat Mayweather in an actual fight. He might beat him up with his head, but he’s not going to be able to out-box Mayweather or hurt him with his power shots. Bradley shouldn’t overlook his fight with Marquez on October 12th. This is going to be a really tough fight for him because Marquez is going to be looking to take his head off with every punch he throws. It’s going to be a dangerous fight for Bradley considering that he’s coming off of a fight against Ruslan Provodnikov where he was hurt badly. Marquez is a much better fighter than Provodnikov with equal power. If he was able to hurt Bradley then you can imagine that Marquez will be able to do so as well.